By Spring 2014, all toys sold at Marks & Spencer will be completely gender neutral. The response comes after a series of complaints from customers claiming that the store markets items in accordance to stereotypes. 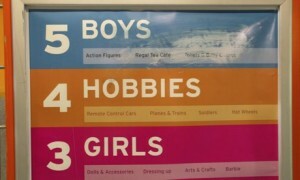 Particular complaints stemmed from a range of toys called ‘Boy’s Stuff,’ which included toy cars, planes and dinosaurs. The description on a pop-up fire station reads ‘this pop up fire station is perfect for little fire men everywhere.’ Similar descriptions adorned the packaging of a watch and joke book. ‘Boys know all the best jokes and here are 500 crackers to keep you ahead of the girls,’ reads one of them. The past year has seen a 60% drop in stores separating toys into different sections depending on gender. Campaign group ‘Let Toys be Toys’ said that reports show that one fifth of stores are still separating toys by gender rather than genre. 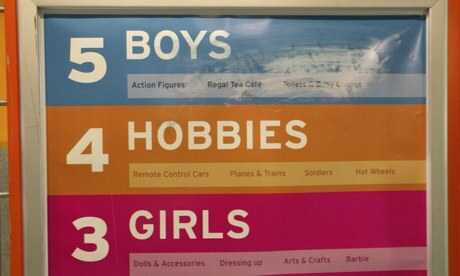 The group, which began in November 2012, continues to call on retailers to put a stop to gender stereotyping. However, ‘Play Unlimited’ are also praising companies that don’t subscribe to gender stereotyping. Hughes acknowledged the gender-neutral marketing and packaging of Swedish home wares store, Ikea. ‘In the same way that parent’s don’t wish to limit their daughter’s play, imagination or future to dolls, kitchens, make-up and pretty dresses, I refuse to limit my sons to soldier games and lawnmowers,’ said Hughes. This entry was posted in News and tagged gender, News, stereotyping, toys. Bookmark the permalink.